Not far removed from the more tepid Lyrid meteor shower, the Eta Aquarids have arrived and will reach their peak on the night of Sunday, May 6. The volume of meteors isn't as spectacular as the Perseids later in the year, but the Eta Aquarids are known to produce some bright "shooting stars." Bill Cooke of NASA's Meteoroid Environment Office told Thrillist to expect around 25 meteors per hour the night of the peak, with the most meteors visible just before dawn on May 7. The Eta Aquarids are one of two annual opportunities to see a shower created by the passing of Halley's Comet, which won't swing past Earth until July 2061. Like any meteor shower, it's fun viewing, but this year the Eta Aquarids will be competing with a moon that is just past full. That will reduce the number of visible meteors since the shower is relatively faint already. Outside of the peak, you may spot an occasional shooting star, as the shower lasts from late April until mid-May. This shower is best seen from the southern hemisphere. If you're in the northern hemisphere, the show will be better the closer you are to the equator. That's in part because of the location of the radiant, which is the point where the meteors appear to emanate from. Any residents in the northern parts of the contiguous United States can console themselves knowing that people further south aren't going to benefit from a G1 geomagnetic storm from Thursday that will likely make the Northern Lights visible to residents of some northern US states, according to the Space Weather Prediction Center (SWPC). The radiant is the star Eta Aquarii in the constellation Aquarius. The constellation will appear low in the southern sky for people further from the middle of the country up through the northern reaches of the United States. The meteors will appear to emanate from the radiant, but you shouldn't stare directly at it. Meteors will be moving away from that point, and it may cause you to miss some. As Cooke noted, you should go somewhere away from city lights with a dark sky and no obstructions along the horizon. Lay on the ground to give yourself the widest possible view of the sky. It's also recommended you arrive at your favorite dark sky spot ahead of your target time so your eyes have time to adjust to the darkness. There have been a couple meteor showers in a row, but it's going to be awhile before the next big show. The Southern Delta Aquarids are up next and don't arrive until late July. 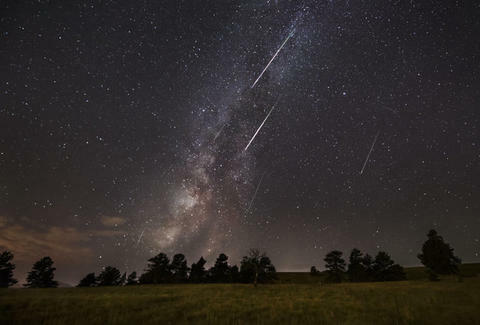 Then in mid-August, the Perseids will alight with more than 100 meteors per hour at its peak, which is a must-see show.